Source: Greenwich Graphic. April 13, 1901. Mr. Seaman Mott Mead, of Greenwich, and Miss Edith Vaughn Parker, daughter of Mr. and Mrs. _____ Parker, were married at the home of the bride, "Shady Cliff," at Hawthorne, Wednesday afternoon, at _____ o'clock. The ceremony was performed by the Rev. J.H. Selden, pastor of the Congregational Church, Greenwich. The bride wore beautiful white satin dress trimmed with Irish ____ and she carried a bouquet of white ______ and lilies of the valley. The bridesmaids were Miss Cordelia Willis Mead, of Greenwich, and Miss May Cornell, of Brewster, N.Y. Their gowns were pink crepe de ch___ and they carried shower bouquets of white roses. Miss Catherine Vaughn, of _____lvn, N.Y., was maid of honor, and she wore a dress of white organdie and she carried a basket of white roses and lilies of the valley. Mr. Preston Parker, brother of the bride, was groomsman. The house was beautifully decorated with flowers and palms and _____ted plants. After the wedding supper, ____ was enjoyed by about ninety _____. Mr. and Mrs. Mead left for a short riding tour, and when they return they will make their home in Greenwich. Source: Greenwich Graphic. October 17, 1913, Page 1. Illustration from S.P. Mead's History and Genealogy of the Mead Family. Some one remarked to us the other day in speaking of the houses of Greenwich, the beautiful homes and residences, how few of them were built of brick, and the question came up, when was brick first used in Greenwich, and where was the first residence located. The home of President W. H. Truesdale, of the Lackawanna railroad, known as the road of anthracite and Phoebe Snow, stands on the site or very close to it of the first brick house in Greenwich. The brick used in its construction came from Holland. Just think of it, bringing brick from Holland. The reason was they could be bought cheaper and brought to this country at less expense then they could be obtained here. The house stood opposite the Mianus river, some quarter of a mile away from it, and that was all a big farm and this was the only house in that locality. President Truesdale's house, which is on the site or near it, is at the east end of Bruce Park and about a quarter about a mile from the Cos Cob station. The house was built in 1830, by Ephraim Mead, and was considered one of the places of Greenwich, and was the talk of the community. Farmers from all over town and Stamford and Port Chester came to look at it. It was delightfully located, as so many of the old farm houses in Greenwich were, near the water, with wooded fields and meadow lands of many acres. The brick house was erected near an old Colonial dwelling, which was built before the Revolutionary War and had a history. This old house which gave way to the new and modern brick one, representing as they did the old and the new, was occupied by Ephram Mead's father, Deliverance Mead, who lived in it during the Revolutionary War. He had been a soldier in the French and Indian wars and saw severe service. In fact his exposure and privations made him so sick that he was incapacitated from further military duty. He was only one of many who gave their lives in defense of their convictions, which brought them here as colonists. The old house was attacked many times and pillaged by Tories and Cowboys. About the only way the family succeeded in maintaining their existence was to hide their ham and potatoes under the barn door, and make ____ to their ____ at night when they could not be seen by spying eyes. The valuables that the family possessed, and those were few of course, were hided under a pile of oysters and clams shells, for in those days oysters and clams were principal articles of food outside of ham and potatoes and there were great piles of oyster and clamshells about all these houses along the Sound. Ephram Mead, who lived in the brick house and built it, left one son and several daughters. The son was Isaac H. Mead, who acquired the interest of his sisters in the farm and became the sole owner. He left a number of sons, among them Ephram T. Mead and Amos H. Mead, well known residents of Greenwich, Dr. Clarkson S. Mead of Port Chester, Willard H. Mead of Wolcott, Wyoming, and Spencer P. Mead of New York, the author of 'Ye History of Greenwich,' which was published recently and which is said to be one of the best gifted local histories published in this country. This famous brick house was torn down in 1895 to give way to President Truesdale's handsome country home. The bricks that were in this first house built in Greenwich were not thrown away or discarded, but were used again and composed the front of a business building on Railroad Avenue, now owned by Rudolph Bolte. 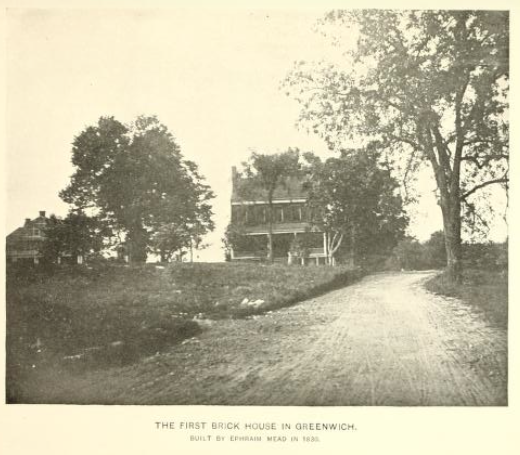 Thus you have the history of the first brick house in Greenwich.